This topic contains 0 replies, has 1 voice, and was last updated by ADDIE 1 year, 3 months ago. 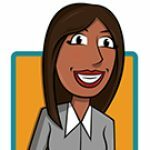 I’m an instructional designer at a large public institution, working on a team that supports hundreds of online instructors within dozens of departments. As we work across disciplines, we see creative problem solving, enthusiasm, and great work being done at our university, and we strive to share ideas and connect faculty working towards similar goals. We’re struggling to create a space for faculty to have an easy way to interface with others teaching online so that they may seek thought partners, showcase work, and find resources. We think this collaboration will have an enormously positive impact on student outcomes and the quality of online instruction – we just don’t know how to do it! Can you help us solve this conundrum? We want to overcome departmental barriers and a general lack of time to provide a platform for easy collaboration. We would like great ideas and best practices to be shared easily throughout the university. Where should we begin? And how will we maintain a dynamic and engaged community of users? Congratulations on wanting to showcase your online faculty’s work! It’s exciting to hear that your online faculty are displaying such dynamism and engagement—the question now is how to harness that energy, creativity, and enthusiasm in a way that can be shared and nurtured over time. One of the challenges facing instructional designers at institutions of all sizes is the nature of online teaching: reaching faculty who are dispersed geographically even when teaching in the same department. A well-designed virtual collaboration space for faculty can facilitate the kind of sharing that you would like to see happen on your campus. The question, then, is what would that space look like? And what kind of support would faculty contributors need? The first step in creating this collaborative space – a virtual “teacher’s lounge” – is to involve faculty in the design process. The October 2017 edition of TOPkit Digest has some tips regarding Building Faculty Buy-In in faculty development. Questions to ask include how such a virtual collaboration space should look and function, who will manage it, and what kind of control will faculty have regarding the use of its content. Faculty members’ input for creating the virtual collaboration space will enhance their feeling of ownership of the space. Their suggestions, too, will better fit their needs. Once you have the design requirements finalized, it’s time to select the platform that will house your online collaboration space. This platform can be your current learning management system or some other platform – as long as the platform offers the functions needed to develop your design. For example, National University built a virtual “faculty commons” where faculty can share their work, best practices, and collaborate with one another. This faculty commons was created in “partnership with GoingOn Networks, with links to other solutions on campus that housed resources like a streaming video repository (Kaltura) and a virtual meeting center (Adobe Connect). Next, resources that support online faculty in making the most of their “virtual teacher’s lounge” are essential; these resources can consist of documentation, just-in-time support from instructional designers or technical support staff, and templates that scaffold best practices (TOPkit, Provide Instruction in the Required Technologies). Examples of documentation include LSM-related information and university-wide goals for teaching and learning. Templates may consist of sample course homepages, examples of well-designed group projects, and online activities or games. Finally, there is a role for instructional designers in the long-term watering and feeding of an online faculty collaboration space. 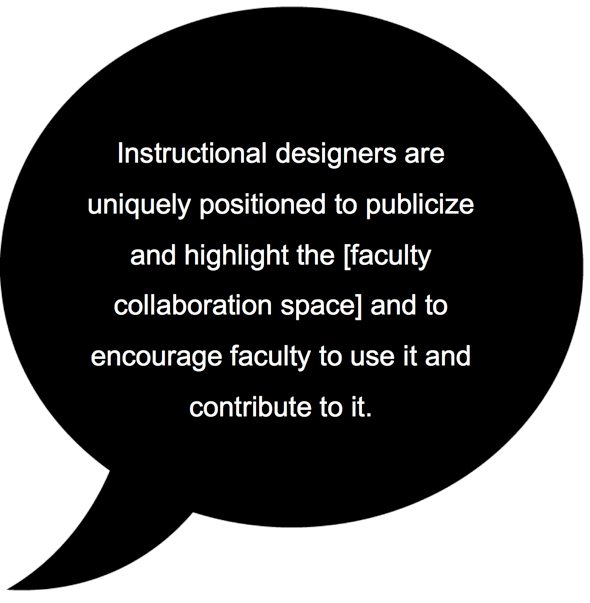 Instructional designers are uniquely positioned to publicize and highlight the site and to encourage faculty to use it and contribute to it. Along with faculty, instructional designers can participate in, and contribute to, the collaboration platform, offering explanations, posing questions, and emphasizing best practices. They can also scaffold content areas to help faculty contributors organize and share their work effectively as well as encouraging continuous improvement. In closing, what are some additional potential challenges and benefits associated with creating an online collaboration space for faculty that haven’t been mentioned in this response? Are there tools and techniques that can support and encourage faculty to contribute to and benefit from such a collaborative space?